World No 1 Lydia Ko won the Kia Classic by four strokes over Park In-bee in southern California on Sunday. Ko shot 67 for a 19-under-par 269 total on the Aviara course in Carlsbad, for her 11th LPGA victory. The New Zealand teenager seemed to be cruising when a putt from off the green at the 10th hole led to a double-hit. As she struck the ball, it popped almost straight up and hit the shaft of her putter, near the top of the hosel, before trickling forward onto the green. Ko took the mandatory one-stroke penalty and bogeyed the hole but she made five straight pars and then after South Korean Park, who was playing a few groups ahead, pulled to within a shot with a birdie at 17, Ko concluded with three birdies in a row. “I started off real well and gave myself opportunities on one, two, three and four,” the 18-year-old Ko told Golf Channel. Ko will seek her second major title at the ANA Inspiration, which begins on Thursday, to go with the Evian Championship she won last summer. Catriona Matthew closed with a 74 to finish in a tie for 43rd on level-par. Ryder Cup star Ian Poulter failed to secure his first victory since 2012 as Tony Finau won his maiden PGA Tour title in a play-off in the Puerto Rico Open. Poulter, who missed out on a place in the WGC-Dell Match Play by just 0.044 world ranking points, took a one-shot lead into the final round at Coco Beach but could only manage a closing 72 to finish a shot behind the American pair of Finau and Steve Marino. Finau eventually won the title with his third straight birdie in the play-off on the par-five 18th after getting up and down from a greenside bunker, while Marino three-putted from long range. Poulter, who carded one bogey, one birdie and 16 pars in the final round, said: “It’s a shame. Just slightly disappointing. Finau told pgatour.com afterwards: “I’m still a bit overawed, it hasn’t all sunk in yet, but I played my heart out today and I’m glad I came out with the win. “I knew I was going to make some birdies but I knew I was probably going to make some bogeys too, it wasn’t easy to judge the distances with the wind. Neil Fenwick joins Paul Doherty and Duncan Stewart in flying the Saltire in the second MENA Tour event in quick succession in Morocco. The inaugural El Jadida Championship by HLO gets underway today at Royal Golf El Jadida course in the picturesque port city on the country’s Atlantic coast. For Fenwick, it’s his first competitive outing of the season and also his first start since becoming a father. Doherty and Stewart will both be looking to improve on performances behind Zane Scotland in last week’s season-opening event at Mohammedia. Abertay’s Christoper Low set the pace in the 94th Scottish Student Golf Championships at Moray. 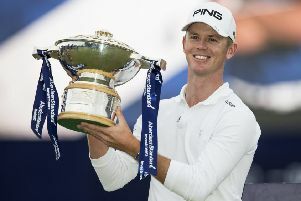 He carded a two-under-par 68 on the New Course at the Lossiemouth venue to sit a stroke ahead of Stirling’s former Scottish Boys’ champion Craig Howie and Lukas Michel (St Andrews). In the women’s event, St Andrews duo Alexa Hammer and Marie Danielsson posted matching level-par 75s on the Old Course to share the lead.